Thursday afternoon in Atlanta, the Phillies' Joe Blanton took advantage of the Braves' apparent hurry to catch their flight, and put them away on just 88 pitches, giving him the second Maddux of 2012. Hat tip to Joe Blanton! Over the last ten years, this is only the 11th Maddux on fewer than 90 pitches. Hours later, in Anaheim, during the last game of the night, the Blue Jays' Brandon Morrow was sitting at just 85 pitches as he headed out for the 9th inning. He had an excellent chance at throwing the second Maddux of the day! Alas, an 8-pitch battle against Erick Aybar all but ended that chance. Morrow wound up using 102 pitches to finish off his shutout. Close, but no cigar. Two Madduxes in one day would truly have been special. It hasn't happened since 2005, and has occurred just six times altogether in the 25 years of the Maddux era. UPDATE: Only a couple weeks after writing this, there were two Madduxes on the same day for the 7th time. I've added those to the list. Stieb was one of the best pitchers of the 1980s and deserves more renown. This was a one-hit beauty for him. Hawkins is probably best known for pitching a no hitter in a game his team lost. This was one of just two shutouts Cerutti threw in his career. Ken Howell led the National League in wild pitches in 1989, making him something of an unlikely candidate to throw a Maddux. Krueger gave up only 2 hits in his game, while Sanderson needed just 86 pitches to complete his. Neither of these guys is really a household name, but that need not be held against them. The man himself! This was Greg's final Maddux as a Cub. It was Navarro's second Maddux of 1992, further proof that not every pitcher who's thrown a Maddux was particularly Maddux like. There he is again. I told you, there could clearly be no other name for this statistic. This was the final start for each of these guys before the season-ending strike, which began the next day. Sad for both of them (sad for all of us), but especially for Maddux, who was in the midst of one of the greatest seasons in modern baseball history (seriously, click on the link and look at Maddux's 1994 numbers. Hell, look at all of his numbers). That's right, three in one day, triple-Maddux! 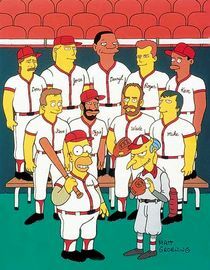 Carpenter is of course a great pitcher, he would go on to win the N.L. Cy Young award that year. On the other hand, this was the only shutout of Mitre's career, and quite possibly his best performance in the big leagues. Ohka managed to give up 9 hits in his game, tied for the second most in Maddux history. Kendrick worked around 7 hits to pull his off, while Santana allowed just 4, while striking out 7. Neither of them issued a single walk, which is helpful in accomplishing this feat. So, there you go, only six seven times have multiple Madduxes been thrown on the same day. Today was about as close as you can get without it actually happening. 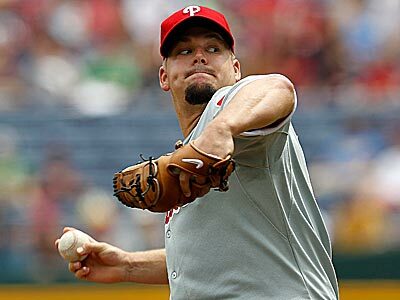 As it is, Joe Blanton joins Philip Humber on the list of pitchers who've thrown a Maddux in 2012.